There are people who routinely kill elk with 270 caliber rifles. Many archers, inlcuding myself, regularly kill elk with arrows that leave the rest at significantly less than 300 feet per second. I hunt with only a 60# bow and 27" draw. Shot placement is key. Shot placement requires accuracy. Accuracy requires practice. With accuracy, even a slightly quartering-to archery shot can be deadly. Take a look at the drawing below. Notice how much open area into the lungs is available behind that front leg bone. The bend at the joint leaves quite a bit of room to tuck an arrow or bullet into the vital area on a quartering-to. I have killed two bulls with slightly quartering-to arrow shots. One at five yards and one at 40 yards. Both bulls died quickly. I was surprised to find that there was no damage to the leg muscle. 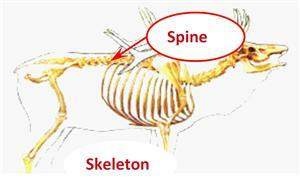 As long as you can miss that leg bone with an arrow by tucking it in tightly, a slightly quartering-to can be deadly. Same with a rifle, as long as the shot placement is well placed. Many people will responsibly avoid taking any shot that isn't broadside. That is wise. We need to know our limitations. Responsible archery shots require knowing the distance and accurate shooting. Knowing the distance and accurate shooting requires practice doing both (Guessing accurately, using a range finder quickly, and shooting accurately.) If we know our limitations, we can make responsible shots. If our skills are good, it will open up opportunities for more responsible shots. Study the photos above and below and memorize what's inside. 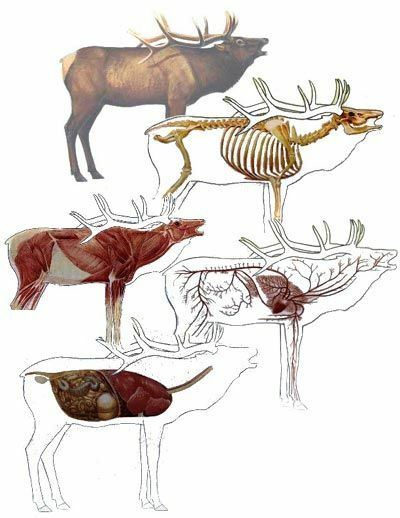 Study the anatomy of a deer and elk when you gut your kill. Know what's inside and put an arrow or bullet in the best spot given to you that you can place skillfully. OR, skip the shot and wait for one that you are confident in. Below is a link to our page with the video of a five yard quartering-to shot. If you understand the anatomy, this shot can be deadly. Just make sure you can place it with pinpoint accuracy and that you understand the anatomy inside. HECS (Human Energy Concealment System) increases our ability to prevent detection of our presence as living beings by animals. HECS is now being made in as a great underlayer! 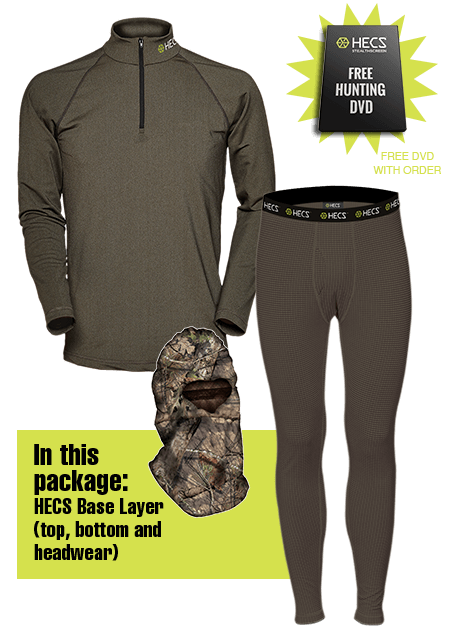 We can provide free shipping in the U.S. for all HECS products. . See more about HECS here.